Our Team at Eugene Realty Group works hard to build lasting relationships with all of our clients. Nothing is more important to us than the great service we provide and the positive experience you have with our company. We are honored to share with you some of the kind feedback we have received from former clients. We are new to Eugene and Paul helped us buy our home in the South Hills. At all stages of process, from driving around with us in a variety of neighborhoods and looking at homes, to the competitive bidding stage in such a hot real estate market, dealing with seller's agent and all of our little questions about the house, to the closing Paul was professional, patient, knowledgeable and definitely an advocate for us. I would recommend him very highly. He's a great guy too! SIX STARS I ‘highly’ recommend Aleaha! For me she was my ‘Knight In Shiney White Armor’. I was in a situation where I needed to sell my house, like, yesterday. And she darned near did just that. She found a buyer comfortably within 36 hours of putting my house on the market...on just the third showing! Besides her knowledge of real estate (which she continues to enhance through courses, etc. ), she’s also a logistics expert and the slayer of snow storms! In her city version of ‘Big Wheels’ ;-) , she got me to the Title Office (And Jill, who was the only person to make it into the Title Office) for my signatures in 12-14” of snow when all else was closed, many without electricity. Aleaha (and her entourage) helped move me out in a snowstorm. Now ‘that’s’ dedication, not just to a job, but to people too. That can sometimes get lost in the mix. Sign here, thank you goodbye. I owe Aleaha a heartfelt Thank You! "Please know how much we appreciated the excellent help we received from or realtors Alyse Stone and Neal Benson. We had to sell our sons home under sad circumstances, and their heartfelt compassion helped us through the whole way. They went above and beyond for which we were grateful. We would highly recommend them!" Amber is a superb Real Estate Agent who has helped me with two transactions (homes) in the last year. She is super attentive, fast to reply to any communication, and very positive and friendly. She provides the extra services I've not seen others do before including helping with cleaning when needed and helping arrange moving tasks/boxes. She will be flexible to help you get the home sold/purchased for a successful closing. I highly recommend her real estate services. Katie Juth - Unicorn Realtor! We've purchased homes in the past and have never had an experience like this one, and it is all because of Katie. Experienced, caring, hard working and ALWAYS available. We began working with Katie from out-of-state a couple of months before moving here. She went out of her way visiting properties we liked, took extra photos, let us know if it was priced appropriately and even toured a rental home or two for us. We were getting nervous because we needed to sell our home just as we were heading into the off-season. Thinking the house would be on the market for quite a while, we braced ourselves for a long wait. Not so, as Kendra Lewis got right on it immediately. The sign went up, the open house was scheduled for the weekend and after only four days on the market, we had an offer. We appreciated her proactive and professional approach. Everything went smoothly with the paperwork and she was there with us every step of the way. In less than a month we closed. Her husband Clint is her 'tag team partner' and together they make a spectacular team. If that weren't enough, they are both very positive and cheerful about everything. We believe that we might not have had such great success with another real estate agent and we highly recommend Kendra if you're needing a realtor. - Chris H.
I highly recommend Amber as a realtor in the Eugene/Springfield area. She is a pleasure to work with because she is easy to get along with, is fast and ahead of the game with paperwork (which was always done correctly), and the homes she brought me were always spot on with what I was looking for. The Eugene market moves quickly so her promptness having offers ready was appreciated. Always felt I was important when working with her. Had a great experience and landed with a great house working with Amber. Thank You! – Courtney C.
Ashley is the absolute best! Very responsive and guided me through the whole process every step of the way. I felt I was in the best hands with my important purchase. I highly recommend her! - Heather M.
We recently sold and bought our dream home with Amanda and she was always willing to meet us whenever we had places to look at. We even had a difficult to sell home (was near I-5) and she never gave up! Was always there to do open houses and going to realtor weekly meetings to showcase our home. We looked at 100's of houses to buy and she was determined to help us find exactly what we were looking for! - Patty M.
Sunday was attentive to our needs and wants! She constantly went out of her way to show as many houses that our work schedules would allow. I will continue to recommend her to everyone! She was an absolute please to work with! - Lindsay R.
After working with Donna on a challenging purchases, I can't recommend her enough. She is very hardworking and knows what needs to be done at each step. Every question we had was answered promptly and politely. She will not let you down. - Aaron M.
Erin represented us in the sale of our family home in Eugene. She is pleasant, confident and enthusiastic. She understands market analysis and will do a great job representing either the buyer or the seller. I was overseas when our house was listed, and when it was sold. There was never a time that I stressed about anything as she was in complete control. Erin even sent us a care package after we had moved to a new state. I couldn't recommend her enough. She is an absolute superstar. - Thomas P.
We had the difficult task of trying to buy a house in Eugene while we were still living in another state and couldn't have done it without Neal's help. His knowledge of the area really helped us narrow down our search and he went out of his way to show us around when we came to visit. His responsiveness was key in this fast moving market and responded to me within minutes when the house we wanted came on the market. He immediately contacted the listing agent and because of this, we were able to put an offer in and get our dream house. Neal was available to go to the house for the inspection and for small repairs, etc., when we were unavailable. Overall, the process went smoothly and was as stress free as buying a house can be. - Dana H.
Neal is a great guy and negotiated a price on our home sale that we previously did not think was possible. He also found us a hidden gem of a place to move into and call home. Pleasure to do business Neal. - Kat B.
Amber Lusso helped me buy my home and it closed just 3 weeks ago (June 2018). When I was first looking and saw her listing, she was quite fast in responding to my inquiry even though someone else had their offer accepted already. Later, she again reached out to me right away when the property again became available and was able to help me negotiate a successful offer and ultimate purchase. This is so important in a market like we have in Eugene/Springfield where properties go very quickly when they are priced right. Amber is very pleasant to work with, responds to inquiries and calls/texts very promptly, and was communicating with me regularly and asking how she could help in all sorts of ways, including with all the stresses of moving from an apartment. Her personalized service was unmatched by any agent I had worked with in the past 3 decades! I highly recommend Amber for either buying or selling a home, you won't be disappointed! - Jonathan W.
I'm not even sure where to begin with our experience with Eileen. :) From the moment I spoke with her (a year before we even started looking) she was (is) incredibly warm, personable and understanding! Fast forward to our searches, viewings and closings, I can honestly say my family has made a dear friend! Eileen is ON-TOP of her game, a seriously awesome communicator and a fighter for her clients! What I really appreciated from her was her honesty and openness. As first time home buyers, I always felt that she laid out our options and gave us strong suggestions when we felt on the fence. I really hope everyone's experience with home shopping is as comfortable and seamless as ours was. Eileen, you are the best! Thank you so so much for all of yours and your teams hard work! We are so happy with everything! - Alicia D.
We are very fortunate to have worked with Daniel in buying our first home. He's an amazing guy! Quick to respond to any and all silly questions we may have had as first time home buyers. He worked with what we were looking for, showed us a ton of houses, and we ultimately landed on a really nice place. I would highly recommend working with Daniel for anyone looking to buy or sell a home. - Ant W.
I couldn't have been paired with a more professional and compassionate broker. With a 24 hour work schedule, 2 large dogs and still residing in the home, Clint made the sale of my home one of the most comfortable and non-intrusive experiences. It is my opinion that Clint understands people and works hard at making sure he can meet their needs. He certainly understood my situation and appears to be a natural with helping others. I would definitely recommend calling Clint if you are interested in buying or selling! - Sue O.
I can't begin to express our thanks to Erin for all of her hard work through this buying process. This was our first experience buying and she made it easy to understand. She was very patient with us and always continued to keep us informed on new listings that met our search. She worked with us for about a year and she was truly searching for the perfect home to meet our needs. Erin is now a part of our family and we appreciate all that she has done for us. - S.B. Bryn is such an awesome and knowledgeable agent that made the sale of our well-loved home a fun experience! We've worked with another agent, but had no idea what we were missing out on until we signed up with Bryn. She was so helpful and set the right expectations from the very beginning so we were familiar with the entire process and timeline. From start to finish, she was attentive and very responsive to any questions that arose. Bryn has incredible attention to detail and growing up in the area, she is very familiar with lane County and what each neighborhood has to offer. She does her homework to know both parties' concerns or requests are discussed and resolved. We will absolutely use her for our next home purchase and would recommend her to anyone looking to buy or sell. - Kaity B.
Bryn was an excellent partner in the home buying process. We bought our first home with Bryn's help and she made the process easy, smooth and even enjoyable. She is always responsive to every little question or request we had and even had answers many times before we would ask a question. She got to know us quickly and was able to recommend and show us properties that fit our needs and wants. We highly recommend her as an agent. - Nate C.
Aleaha was recommended by a family friend. We are first time home buyers and needed a lot of help. Aleaha helped us through the entire process and would meet us on short notice at any time to view homes or pick up the phone to help us with the many questions we had. She helped us find an amazing home and was an overall joy to work with. - Nathaniel V.
Eileen McMahan was extremely proactive and efficient in finding our ideal house and worked with us through the negotiations and docu signings in a seamless process. She has prompt responses to questions and communicated well too. I look forward to working with her again in the future! When it came time to sell my home, I needed someone who would be proactive, anticipate the unexpected, keep me informed every step of the way and could help even when I did not know the right question to ask. It was a stressful time for me anyway and selling my home, well, let's pile on the stress right? In all my years, I have never come across a Realtor like Jenniffer! She was always right there, supporting me and keeping me happy. She was attentive, responsive, patient, knowledgeable, skilled, fearless, and most important to me: a listener! So many Realtors have "the agenda" in their heads and you have to try and fit into their space. Jenniffer was open and flexible, yet kept the process moving in a positive direction even when things got tough. In short, she made our agenda, her priority. The amazing thing was my house went under contract in about a week after it was first posted for sale and at a price I did not think was even obtainable. It was incredible! I have recommended Jenniffer to every one I know, family and friends. One of the hardest working people I've ver met, truly professional and a genuinely nice person as well! The process of selling or buying a home is incredibly difficult today. Jenniffer made it easy for me. Few realtors compare, none are better than Jenniffer. - Thom J.
Amanda helped us into our first home, and I couldn't imagine anyone more patient or knowledgeable with our very challenging fha purchase of a foreclosure. There were more bumps in the road than not, and after seeing countless homes, Amanda never gave up or became less available in our search, as long and tiring as it got. She was honest and consistent for the entire 6 month process, and I also got to witness her interactions with other clients, and can say that she brought them the same level of professionalism, kindness and patience that we experienced! Thanks Amanda! - J.D. Amber was extremely helpful with every step and went above and beyond to make sure I got what I needed--sometimes going out of her way to make sure I was happy and taken care of. She is the best and I would definitely go to her again. - Kat A.
I would recommend Zoe Brady, with the Eugene Realty Group, to anyone looking for an excellent, highly motivated and committed realtor. Zoe was a pleasure to work with throughout the entire process of selling the house. She quickly focused on every detail of the sale process thoroughly, and sold the house with amazing speed. She made the sale process such a fast and easy experience for me. Zoe gets my very highest recommendations! - Dan M.
Clint Lewis is very knowledgeable, helpful and professional. He has helped us buy and sell rental properties in the area and we feel fortunate that we found him to be our "land advocate." He works hard and responds promptly to all questions and concerns. We highly recommend Clint Lewis! -N.L. Ashley is absolutely amazing. My husband and I consider ourselves very blessed that she is the one that answered on that Saturday when we had to suddenly switch gears in our home buying experience. The seller's agent was difficult to work with, but that didn't deter it one bit and now our family is moving into an amazing house. - Melissa B.
Cambria is an amazing realtor and is always looking out for your best interests. She had a lot of patience with us as we looked at homes weekend after weekend as we lived in Portland. She always made time for us no matter what. She always communicated with us and kept us up to date on everything, including with having her baby. Cambria was out on leave and was still looking out for us. Cambria told us about a house that we might like and arranged for us to look at it while she was on leave. This was the house we loved and Cambria helped us strategize our offer to get the home over all the other offers that came in. We didn't just find a great realtor, we believe we found an amazing friend. We would recommend Cambria to anyone buying or selling their home. Wish we would have found her sooner to sell our home in Portland. Thanks, Cambria, for all that you did for us. - Glenn & Sherry M.
Josiah helped me sell my house and buy a new one. The whole process went easier than anticipated. My house sold in a matter of days and I got more for it than I expected. He was responsive, knowledgable about the local market, flexible with my schedule and patient with showing me new places. We looked at a lot of houses and although what I wanted changed over time, he was easy going and helped me narrow down what was really important in a new house. - Samantha M.
Buying a foreclosed property tends to be a roller coaster ride. We certainly had some unexpected turns, but Zoe helped us anticipate and respond effectively. As first time home buyers, we had a lot of questions. From start to finish, Zoe was consistently eager to help us understand the process. She was always willing to show us properties we were curious about. And when the opportunity presented itself for us to get his foreclose house on Holly, she managed a lot of the difficult communications of dealing with a foreclosure. In what was a sellers market, Zoe helped us get a lot of our requests fulfilled. She was more than generous with her time ensuring that many of the repairs we needed were completed before we finally moved in. We would certainly chose Zoe again if given the chance and would highly recommend her to others seeking a house in the Eugene/Springfield area. - D.T. We had a wonderful and friendly experience with Katie. She is patient and even when we showed up a little late, she didn't mind. It must take a whole lot to work with people's different likes. She found us the best of homes. Thank you again! - S. Lewis. Zoe is a highly knowledgeable and professional real estate agent. It was a pleasure working with someone who is sincere and really does love her work. I appreciated her accessibility, responsiveness and regular communications - she was always available. I'm glad I had her negotiating skills on my behalf! - C.C. Paul is great! As a first-time home buyer, I was very unsure of how the process worked. He was really clear in explaining how and when everything happens when buying a house. I'm so glad I found him! You won't find a more knowledgeable, helpful realtor in the Eugene area. Highly recommended! - Z.U. I'm a first time home-buyer and Curtis made the entire process seamless and straightforward. Responding quickly to every call, text and email, Curtis made sure I understood every step of the process and didn't pressure me into properties I didn't like. And when I did find a property I liked, from offer to closing, Curtis was on the ball. Catching and correcting issues from the inspection, seller's agent, even the lender. On behalf of Ray and Betty Cellers, Amanda Parker of Eugene Realty did an excellent job of selling our home quickly and without problems. -Leta T.
Worked with Tiffany Johnson here at Eugene Realty Group and had excellent service the whole way through! Would highly recommend this place to anyone looking to buy or sell their home, especially Tiffany in general. This is my third time purchasing a house with Tiffany, and couldn't ask for a better experience! Thank you! -Ryan T.
Working with Katie was not only professional and informative, but a real pleasure. She is so pleasant and easy to talk to and helped us every step of the way. I appreciate your expertise very much. She made what seemed like a daunting task so smooth. I can't say enough great things about her. I got the recommendation from my financial advisor, Jo Lane, and I am so thankful. I would highly recommend her to anyone who is in need of an agent. Thanks to the team at Eugene Realty! - W.S. I'm a first time home owner and Clint was recommended to me as the best in the business. There's no doubt I couldn't have found a better real estate agent or trusting person. It seems like every time there was doubt or worry, Clint was always there day in and day out to make sure every person involved in the process kept us in the loop at all times! That not only takes commitment, but a guy who really cares about people and not just a pay check. I will always be grateful and feel blessed to have taken my first journey as a home owner with Clint! - Michael D.
Such a comfortably professional buying experience with Eileen McMahan. With her help, we found exactly the home and at the price we were looking to purchase. - S.M. We had a great experience finding our first home in Eugene. Katie was available for whatever we needed, no matter the day or time. She listened to what we were looking for and helped us to find the perfect house. We just closed a few weeks ago and are loving our new home! - Joe R.
Ashley has been an absolute pleasure to work with. Her communication and response times have been outstanding. She was quick to understand my criteria and needs and focused on finding me quality properties. Throughout the purchasing and closing process, Ashley worked with the inspection company, the seller, and the title company, making everything completely seamless on my part - making the entire process smooth. I will certainly be using Ashley in the future for any of my real estate needs. - Bryan W.
I would highly recommend Cambria. We loved working with her. She was always so helpful when we didn't know what we were doing, as well as, being very patient with us. Nothing was easy with our sale from the get go due to the age of the home. Donna did much or most of the heavy lifting when it came to finding contractors to do required repairs in order for the sale to go through. I really don't know what I would have done since we were far away and I have very little time on my hands. Donna and her boyfriend even came out and helped us cart away trash, which was a huge help!!! She was friendly, helpful and very knowledgeable. The office backs her up with great marketing! You can't go wrong by selecting Donna and Eugene Realty in representing you as either a buyer or seller. Rick is an excellent real estate agent! He's knowledgeable and quick to respond to questions, calls and texts. He's pateint, friendly and comes highly recommended! Clint Lewis...This man is literally worth more than gold! He doesn't wait around for the best commission to come through, and he made us feel like he put us before himself - even making sacrifices for us. If anyone is every looking for a house in his area, they will always get a recommendation from me. My family and I are Christians and we truly believe Clint was sent from God to help my little family close on a house just in time! Donna was the greatest! We couldn't have asked for a better agent to help us sell our home. She kept on top of everything from the day we met her to after the sale was complete. She is honest, hard working and just one of the nicest people you want to meet! Highly recommend her to anyone looking to buy or sell. In fact, we already recommended her to several people. We started looking for a duplex to buy in the fall of 2016. I found a property I wanted to look at, and met Clint for the first time. He was prompt to show me the property and I decided to take a chance that he could help us find what we were looking for. Anytime we needed help, had any questions, or needed updates, he was quick to get back to us. After a long search in a very hot market, we finally closed on our duplex. I couldn't of asked for a more professional realtor. If you are looking for someone who will go above and beyond what most realtors do, Clint is your man! Thanks so much for all of your hard work, patience and help. Yes, I know, all 5 stars...but there are good reasons! In my 62 years, I've bought and sold a number of homes and businesses and have encountered quite a few realtors. Most of them, whether representing me or others, have been pushy, aggressive and at times, down right irritating. Shannon restored our faith in the process with her friendly, knowledgable manner. She always made us feel like we were her most important clients! When a buyer started hesitating on buying our house, Shannon stepped up to give a gentle nudge that closed the sale. Sunday is Golden agent. From being able to be contacted at all hours. To putting in the work for your new home at all hours. She strives to get the job done and is very knowledgeable at it. Along with a strong team to back her. She is a must call agent!! - Chase J.
I was lucky enough to have the pleasure to work with Daniel Faulconer. He is an amazing realtor. He was always willing and able to go above and beyond in order to help me and my family find our dream home. He was incredibly helpful and right there beside me through the whole process. I highly recommend getting in touch with Daniel if you are in the market to buy or sell a home because he is a wonderful realtor. -Amy H.
I got to work with Aleaha to help a couple buy their first home. I cannot stress enough how awesome she was! She is dedicated and available at all times. She went the extra mile to make sure the clients were taken care of and that everything went smoothly. I would recommend her to anyone! Thank you again Aleaha! - Jonathan H.
Erin Basinger was awesome, she helped find me a great home for my family. She knows the Eugene/Santa Clara area really well and was able to find several homes that fit what I was looking for. If you are looking for a great realtor, Erin is the best. - Cory G.
Tina helped my mom find her dream home and is a great choice for your home buying or selling needs. She makes the process worry-free because of her knowledge and professionalism, and makes you feel that you're her top priority. Thank you for all your help, Tina! -Alyssa S.
What can I say… from the first moment you meet Amber, you will know that you have found your realtor! Amber is one of the kindest, honest and caring person you will ever know. -Garth S.
Tina helped me purchase my home, and I couldn't have done it without her help! Tina is very knowledgeable in helping both buyers and sellers, making sure contracts are structured to protect your interest. Definitely recommend!! -Christie F.
A more honest, intelligent up-front person you will never find than Amber Lusso. She's the one to go to if you need to buy your dream home, if you need to sell your home or you're looking for an investment property. -Wanda H.
Kendra not only found the perfect home for me, she was very efficient in her leading me through the steps of first time home buying! -Nancy S.
Cambria is highly personable, knowledgeable and cares a lot! She’s great at her profession and knows how to seal that deal! 5 shining, shooting stars - Yeti M.
I highly recommend Curtis as a buyer's agent. He always answers the phone and moves the process along. When the seller tried to pull a fast one, he was there making sure we didn't get screwed over. - Nicole C.
Tina is awesome to work with. Helped me sell my business in no time at all. Very professional and a will get you what you need. Come see her if you want excellence! -Larry L.
Amber will listen to your needs. She has style and can help you stage your home to sale. -Kristi K.
Sheila is absolutely amazing, very patient, kind and caring. - Sara E.
My husband and I recently bought our first house, thanks to Curtis Phillips. Eugene Realty Group gave us the knowledge and heads up we needed during the home purchasing process. Super friendly staff with our best interests at heart. Thanks Curtis and everyone at Eugene Realty! As a first time homebuyer, Cambria was the best realtor I could have come across. I looked at properties for 7 months and she was there the entire time. She was quick to respond, courteous and helped me through all the stages of home buying. We looked many properties and she always got me in right away and always there to answer all my questions. Her recommendations for everything from mortgage brokers to repairs were amazing. I'd recommend her to anyone buying or selling a home without question. Top notch service! - Andrew N.
Sunday was a very very helpful agent to my journey of purchasing a home. She was always able to be contacted at any time of the day, and was very timely with a response to any question I may of had. She worked diligently day and night. With a very sweet and uplifting attitude she made me feel comfortable every step of the way. Never once did she slack on finding me a home to view, and was always one step ahead for the next possible option for me. This agent was Wonderful! I highly recommend Sunday through and through. If your an out of town person like my self, or even local looking for the best agent. You can rest easily at night knowing you have such an efficient agent hunting for homes for you. - Chase J.
Sheila is such a wonderful realtor and has a very positive attitude! She does her research and keeps up on the latest information to provide her clients with the best possible experience. I would highly recommend her! - Tamela C.
Zoe recently helped me purchase my first home. She was very patient and maintained great communication through the whole process. I felt like I truly had an advocate ensuring my best interest were priority. Can't recommend her enough. - Carol L.
Cambria was fabulous and I would recommend her without question to anyone looking for a realtor. Especially a first time buyer, like myself. She took the intimidation out of the equation, made me comfortable with the process and exceeded my expectations when it came to her communication and availability to answer any questions I had along the way, no matter how trivial they seemed. She went above and beyond! - Cheri H.
Sheila is very kind and she will go that extra mile for you. -Nannette J.
Ashley has such an engaging personality. I love her enthusiasm. She has been so encouraging with our current situation. 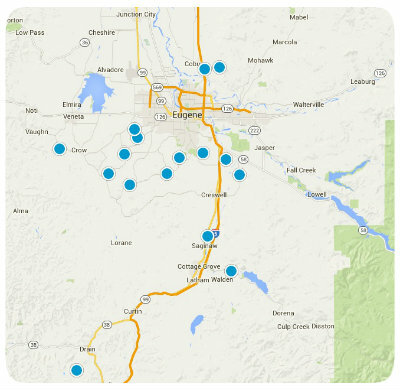 We will soon be listing our home in Deschutes County. After it sells we will have Ashley help us find a new home in Lane County. -Carol N.
Kind and patient Sheila is willing to go the extra mile to get you where you want to be I was very impressed. -Haley R.
I would recommend Cambria Trent to anyone looking to buy or sell a home! She knows her market area and how to provide the best services! She was very patient with us and our difficult wish list and hung in there with us to find the perfect place! I honestly don't know how she did it but she managed to get our offer accepted on a place I never thought we would be able to get! I just loved working with her! - Tina S.
I highly recommend Sheila Riojas as a realtor. Sheila recently assisted me in buying a house. Her professionalism and good nature were unmatched in my experience. My favorite of her attributes was that Sheila was always available. I don't think I ever waited more than five minutes for a reply from her. Even when buying process snagged on one thing or another (never her doing) I didn't worry because Sheila was always on top of things; giving me advanced notice of deadlines, immediately chasing down the answers to all my questions, and sending me frequent updates just I would know where we were in the process. I can't overstate how pleasant it is to work with someone who communicates well and is dependable. Additionally, Sheila was a pleasure to work with. She was always polite, cheerful, and tremendously accommodating. I never got the "used car salesman" vibe from her. In fact, Sheila's enthusiasm and cheerful attitude made the search for a new house an enjoyable experience. If you are looking for a realtor I urge you to give Sheila a try. Sheila is very friendly always has a smile and is helpful would buy from her and tell other people to do the same. - Brenda L.
We can not recommend Tiffany Johnson with Eugene Reality Group enough! If it wasn't for her, we would not have gotten our house! My husband and I are both active duty living overseas and wanted to plant some roots for our babies in my husbands home town of Eugene. We were home on leave and only had 10 days to find a house. She came as a recommendation of a family member and we couldn't be happier! As soon as we called her with some properties we wanted to see, she was on it! The next day we were viewing properties. We came to love a new build and she negotiated what I thought was the impossible. She negotiated new appliances for the house and in a sellers market! Not only was she our pocket pit bull with negotiations with the builder, she got our VA loan turned back on when we were denied 7 days before. She was able to call our lender and negotiate what we thought was a done deal. She then was able to extend our closing date a week later and had the extension fees waived! Not only that, she bought with her own money, a garage door opener as a house warming gift! With us being overseas and communication hard she downloaded an app so we can discuss things over the phone for free. We can't recommend Tiffany enough! She was like having a family member help us. She listened to me vent about the whole process as buying a house in a different country is quite difficult! - Rachael H.
Sheila is super friendly, quick, fast and very efficient. Highly recommended!!! - Katie A. We loved working with Cambria. She is fun and professional and did a great job getting us the house we wanted! - Marci S.
Ashley enthusiastically showed many, many, MANY homes. When we finally found the home of our dreams, the seller's agent was difficult to deal with. She didn't give up, she didn't give in which helped us get into our new home early! You need this agent on your side whether buying or selling. Can't wait for the next one Ashley! - Lisa C.
Absolutely great gal. Sheila is cheerful, friendly and professional. A joy to work with. - Alejandra D.
Kendra was wonderful in helping us find our new home in Santa Clara. We bought the home by having Kendra walk many properties with my daughter Face-timing with us in Florida as they walked the properties. Very good communications and we closed long distance without a hitch. Looking forward to our move to Oregon after the holidays. I highly recommend Kendra and Clint Lewis and Eugene Realty! I’ve known Sheila for years- she’s friendly and professional! - Stephanie H.
Shannon was an exceptional real estate agent! She was a marketing genius and supported us as a friend through every step of the process during the sale and purchase of our home. In this unpredictable real estate market, she was able to sell our home in just a few weeks. - Adrian and Jenny M.
I’ve never worked with a better agent. Thank You So Much for being so thoughtful, reliable, consistent, and downright wonderful! - Karen R.
You have shown me great professional follow through, consistent communication, and you have been conscientious through every detail. I highly recommend you to anyone who needs your services. - Jennifer C.
Bob and I have worked with a lot of agents and we want you to know that you stand way above all the rest. You are kind, considerate, professional, and see to it that every detail has been addressed. Most importantly you listen to what your client wants and respond to those wishes. We look forward to doing business with you again. Thanks for being such a great agent. All your clients are lucky to have you. - Bob and Karen D.
I was extremely happy with the whole process! Finally someone that listened and understood what I really wanted and found it! The focus on detail and your effort to keep me (your client) informed and making yourself available daily during the process was A++. Thank you so much Shannon! - Steve V.
Our experience couldn’t have been better- We got into a house in record time and all transactions and escrow went amazingly smooth. Thank You! - Jessica and Joe B.
Shannon is great! It’s like having a best friend or relative working on your behalf. We could not have asked for more! - Brandon and Tiffany B.
You’ve been more than a Realtor, you’ve been a friend. Thank You! - Diane I.
Shannon was friendly and professional, while aggressive in selling my property. Well Done! - Mitch and Becci B. We loved that you kept us updated either by phone or email. We’re so happy you were our agent and we don’t know what we would have done without you! Thanks for making this a great experience for us. We love our new house! - Luke and Susie C.
From the time we first met, we felt an instant connection with you. Buying and/or selling a home is a “huge” undertaking, and you helped us every step of the way. You were attune to our needs and desires, listened to us and helped us throughout the cumbersome process. Best of all, your sunny smile and great disposition made it a pleasure to work with you. Thank You! - Betty and Bonno K.
This was a wonderful experience for us! Being 1st time home buyers, you explained everything and made it so easy. Thanks for all of your help! - John and Melissa S.
Shannon knows real estate! She kept in touch with us and gave clear answers to our questions. She also found us a great house within less than a week of contacting her. She went beyond what was expected and made us feel comfortable and productive in our search. Thanks Shannon! - Chris C.
Shannon Doyle goes above, beyond, and then some, on all aspects of finding and purchasing a home. She is very attentive and makes you feel as if you’re her only client- excellent one on one service with great communication!! We will recommend her to any and everyone!! And will definitely return if/when we are looking again or selling. - Stephanie and Jay H.
Shannon was especially helpful in the success of locating, negotiating and responding promptly to my questions in the home buying process, I have purchased and sold my homes and rentals in three states, Shannon is the best and her honesty and sincerity is unmatched. The whole experience was a positive one and thanks to Shannon we now have a lovely home for my daughter and her family to reside in. - Bob O.
I understand this may be too blunt for some however, if you’re not using Shannon, you’re making a mistake! Her knowledgeable and courteous assistance was assuring and comforting to have during a special time for me and my family. - William and Cathleen M.
Shannon and Matt are knowledgeable, thorough and the easiest, friendliest realtors we have ever worked with! They made our home selling experience painless! - Alvin and Sara H.
Clint that works for Eugene Realty is AMAZING!! My husband and I had only been looking for our "dream home" a week and Clint found it for us after hearing from myself and my husband what we were looking for in a house...Both Clint and his sister Shannon are very professional...They both continue to keep us informed as we close on our new home and as we try to sell our current home!! I would recommend these two wonderful people to ALL of my friends and family. - David and Stacy B.
Shannon and Clint made a frustrating experience......smooth. They were excellent in defining every option/solution to issues that presented themselves throughout the process. We marked them with 5 stars because that is the level of service they provide. We would recommend them 100%! - Dave and Rhonda M.
We had an excellent experience with Clint and Shannon. Clint showed us several properties and was patient as we searched for the right one for us. He was always looking out for us through the whole process. We found him to be very customer-friendly, hands-on and very comfortable yet professional. He provided such great customer service looking out for us through the whole process. We appreciated his follow up and checking in with us regularly. Would definitely recommend Clint & Shannon! - Marcy and Matt D.
We were first time home buyers and Shannon and Clint were very helpful through the entire process. They were extremely reliable and responsive. Clint showed us at least a dozen houses and helped us find the right one for our family. They even helped when we were having issues with the bank. I would highly recommend contacting them if you're looking for a new home, I know we wouldn't have gotten ours if it wasn't for them! - Kelsy J. and Ryan M.
Clint was very responsive and helpful in our search; first for a home, then for investment property. He was informative, patient and friendly. I highly recommend him for all your real estate needs! - Dianna and Todd P.
Dedicated individuals who kept communication open every step of the home finding process. Always willing to listen & keep our best interests in mind. Shannon & Cambria highlighted all areas of a contract in detail to ensure our understanding of the papers & acknowledged any questions pertaining to the documents being signed. Highly recommend. Best experience we have had searching for a house to buy. - Amber and Calen S.
Cambria was amazingly helpful - Adam T.
Kendra although new to real estate, sold my mothers house in two days! This sale was delicate as my mom has terminal cancer and selling her home of almost 40 years was a tough must do decision. She handled the sale with professionalism, courtesy, and a very business smart attitude. We were so pleased with her efforts that we asked her to help sell one of our rentals. Looking forward to asking her to help again sometime in the future when we decide to sell our primary residence. I would highly recommend Kendra as a first choice realtor for any buy/sell you may have. - Vicki and Barry H.
We would recommend Donna to anyone. After having such a horrible experience with our first REALTOR, Rob and I were pretty fed up with REALTORS as a whole, but we needed to find a home asap. Donna came highly recommended by one of our closest friends so we thought we would give her a call and see if she was as good as our friend said she was. Donna was everything they said she was and more! We can't rave about her enough. She went way above the norm to help get us into our new home. She is great to work with, knows her business very well, is a hard worker, does what ever it takes to get you into your new home and has fun doing it. We enjoyed our time working with her and we feel we developed a friendship along the way. She is a wonderful person and an excellent REALTOR. - Rob and Kimberly C.
Cambria worked her tail off for us! She advised us well, listen to our needs and searched for properties constantly. She friendly, helpful, funny and energetic. She's just awesome! I searched on Zillow for a realtor to sell my father's home in Eugene. I sent out 3 requests for realtors and Matt Doyle was very prompt with his reply. When we met he was very prepared with presenting me a note book of the home sales in my area and information about the house itself. After chatting and he began his assessment of the home and came up with a number that suited house. Since Matt is a very 'likable' person, speaking with him was easy and since I live out of state, keeping in touch is something he excels in. Matt is very dutiful with his tasks such as making sure what needed to be done with the home to make it more profitable. He had contacts available for me to use such as his landscaper, general contractor and his photographer. When the house was vacant, we called upon Matt to check on it and even watered the lawns, purchased and installed the proper smoke and carbon monoxide alarms and various other things for the home. The team at Eugene Realty Group are fantastic to work with! Again, since I live out of state DocuSign was a key element in making sure the details were correct and documented for all parties. Everything was well explained by the team so there were no surprises. If I had any questions or confusion, an answer was just a few moments away from the team or a call from Matt, they made me feel like I was a 'top priority' client. The Open House went really well! The house was placed on the MLS and various other websites, and the fantastic job the photographer did returned a lot of viewers and many offers!! Inspections and closing went smoothly and the new owners were anxious to move in before closing, so it was arranged that they could. As one could read here, I was so TOTALLY SATISFIED with the entire experience as this was my first time selling a house. The thing for me was that I had complete faith and trust in Matt when I first met him that I did not need to shop around for anyone else. I am very happy with my decision and feel that I did my Father proud! - Cathryn C.
On behalf of my two sisters and myself, I want to thank you so much for the effort and kindness you put into selling Mom’s home for her and for helping to make this a smooth transaction for her. You went beyond the call of duty in taking papers to her, etc, etc. Your kindness is greatly appreciated! - Sandy T.
Shannon kept us fully abreast of all that was going on during both a sale and a purchase. Some agents specialize in a specific area of the Real Estate game, Shannon changed hats without breaking stride. She is a delight and we know that we got the very best service possible. Don't forget Matt, he ain't bad either. Thanks to both of you! - Bob and Hazel K.
My wife and I met Matt Doyle from Eugene Realty Group in June of 2016 based on a recommendation from one of our family members. Our goal was to sell our home in town and purchase a home further out of town with a little more elbow room. Having listed our home the year before with someone else and not experiencing success we were a little gun shy and actually were not sure we even wanted to put our house back on the market. Selling a home does not go without some stress and road blocks to overcome along the way. Simply put we were just not sure we wanted to go through another potential negative experience like we had just gone through the year before. When Matt came to our home to meet us and take a look at our house we quickly realized this was our guy. He was very easy to talk with and was very personable. After walking through our home and asking us some key questions he quickly assessed our needs. After explaining what was going on in the local housing market in our area at the time and answering our questions truthfully and honestly he put together an impressive plan that he and his wife Shannon would use to sell our home. This was not our first home to sell and yes the plan did include some of the standard tools used by most good realtors but it also included some "out of the box" strategies that proved to pay dividends in selling our home. One example, where the year before we had zero visitors come look at our home at open house, with Matt and Shannon we had over 40 people come look at our home open house weekend. We actually had an offer the first day of open house. Even though due to buyers issues that fell through, within 6 days of our house going on the market we were under a strong contract. During the process of the sell there was a lot of paperwork, inspections, road blocks, and legal paperwork that needed to be completed. In more than one occasion they went above and beyond. Throughout our experience with Matt and Shannon and the Eugene Realty Group we felt as if we were their only clients. On numerous occasions they went the extra mile for us. it is very obvious they are result driven. We were so impressed with how they took care of us during the sale of our home that we chose them when we were looking for a new home. This resulted in the find of a life time dream home. Once again we were treated in the same manner that we were when we sold our home. I could go on and on regarding our positive experience and some of the issues that popped up during the purchase of our new home. Matt and Shannon met each issue with the same tenacity on our behalf. To wrap this up I would like to just say that it takes a lot for me to take the time to sit down and write out a review or recommendation. I feel strongly enough about Matt and Shannon I made the time. I think back and can remember when Matt stood in our living room and shook my hand and said "you will not be disappointed". He was right. Choose Eugene Realty Group today and you will not be disappointed tomorrow. - Scott L.
As new homeowners in Oregon, it is our pleasure to set aside a few minutes to express our deep gratitude for Clint’s professional services and the kind manner in which he delivered them. This is our 12th home over a 45 year marriage and by far Clint is shoulders above all the other fine realtors we have dealt with over the years. We absolutely would not hesitate in recommending Clint to friends, family or strangers. We believe earnestly, aside from his obvious professionalism, that he is just a good human being. - Caro & Dan D.
We ended up working with 2 agents early on. The difference was clear and we chose to work with Clint. For your real estate needs in the Eugene area, you should too! Here's why. You can tell he genuinely enjoys what he does which makes it feel like a joint feature to make you happy AND he is educated in how it all works to guide you. He figures out what and how you want thing and then works hard to help you get exactly that and in your time frame. From day one, it was all about us, helping us narrow down what we liked and wanted and finding it. Then he was there every step of the way through escrow and ready to help beyond move-in. - Taniqua P.
Clint was extremely helpful in all aspects of buying our house. He was very attentive. He always got back to us promptly and answered any questions we had. I would definitely use him again on any future endeavors. - Kari M.
I first met Shannon and Clint at an open house when we visited Eugene over the weekend. Both were friendly and approachable and were willing to go the extra mile for us. At that point, I wasn't even sure if my family was going to move to the area. We were just considering the possibility. Even during this time of uncertainty, the realtors listened to our specific needs. Later, they helped us make the transition to Oregon. We moved from the East Coast and had experience with other realtors. Clint demonstrated patience, showed us many homes and was not satisfied until we found the location and type of home that was best for our family. When we had questions about a home, Clint made arrangements to have a contractor look at the home structure. He is flexible and accommodating. Whenever we had a question, or needed a recommendation, Clint was so responsive. We are now in the home we've always wanted. Thank you Eugene Realty Group! - Kanoe B. We are so grateful that we stumbled upon Clint. After having a bad experience with a different realtor who wasn't willing to help us at all we made a phone call and Clint was quick to meet us to show us a house right away. He took the time to ask questions about what we wanted and made sure as first time homebuyers we knew what we we're getting ourselves into. Clint is very hard working, which is hard to find anymore. He was always willing to meet us anytime, and answered any questions we had. If you choose Clint you won't be disappointed! - Merissa & Jake K.
She's awesome! - Frank H.
She listens and is very enthusiastic. I look forward to working with her. - Debbie H.
Cambria worked her tail off for us! She advised us well, listen to our needs and searched for properties constantly. She friendly, helpful, funny and energetic. She's just awesome! - Jeri B.
Cambria is a great Realtor to work with. I will use her for every Real Estate Transaction I have. She has a gentle but knowledgeable approach, is very thorough and had my back throughout the whole process. - Justin T.
Cambria was amazing!! She worked so hard for us, stayed in touch at all times, & was incredibly prompt when responding. I highly recommend her for any home you're looking for!! - Megan R.
Cambria was very knowledgable and worked incredibly hard for us. I could trust that she was just a phone call away at all times and knew what I wanted in a property. I highly recommend working with Cambria! - Marielle H.
I gave Cambria a try because she came recommended from a friend, and I wanted to support a working parent. I will never regret my decision! From the first moment, I could tell she was on the ball. She is quite easy to communicate with, incredibly responsive, and knowledgeable not just about real estate, but many other issues pertaining to purchasing a home from start to finish, and beyond. If you want an agent that is a go-getter and truly has your back, I cannot recommend Cambria highly enough! She will be the first person I contact when it comes to buying or selling another home. - Britt S.
Extremely knowledgeable individual who listens to your needs/wants of buying a home. She is 100% dedicated to every client & accommodates crazy schedules. Never cancels on a client & researches in depth different prospective properties to be fully prepared with key features of the home. Keeps you informed of updates on information pertaining to your purchase & guides you through the whole process; from offer to inspection, to appraisal to closing! Cambria Is an exceptional, compassionate, dedicated realtor. - Amber S.
We were Cambria's first sale, and she did an amazing job! We viewed so many different houses looking for the perfect fit. She was incredibly patient and extremely hard working throughout the entire process. We loved her so much that we enlisted her services again to sell an additional property that we owned, and she's already shown us that our original opinion of her was completely accurate. We would recommend her to anyone. - Calen S.
My wife and I were very particular about the home we wanted to buy, plus we wanted to do Federal G.I. financing. We were city folks wanting to move to a rural area as well. We met with a lot of Realtors all over Oregon that would listen to our wish list and then start showing us homes that were not even close to what we wanted. This went on for two years. Then we met Donna Hodges. She was/is a breath of fresh air! She listened to us, took notes, and asked us questions about things we had not thought about. She taught us things about rural living we did not know (septic systems, wells, etc. and what to look for). She helped us to narrow our list by combing features we wanted into what we really wanted (and needed). We thought she was a miracle worker. I am retired so I had a lot of daytime hours available. She met with me dozens of times and showed me so many homes I can not remember the quantity. From every "failure" we figured out more closely what we wanted. In due time Donna finally found our dream home. It had some problems (which was fine with me, I'm handy and like to fix things). However this appeared to be a non-starter because it was an FHA foreclosure, i.e; I could not fix anything until after it closed. In the meantime, Federal G.I. won't close until everything was fixed! Donna was as determined as we were to make this impossible catch 22 work. Long story short,,, SHE DID IT! We bought our tiny farm and totally love it. My wife and I highly respect Donna as a person and as a professional Realtor. I cannot say enough about how much we trust her judgment and integrity. Though not personal friends with Donna, we would welcome that relationship because there are not enough good-to-the-core people in this world. - Mr. Brian and Dr. Catherine W.
On my first house purchase Donna helped through every step of the way . She went the extra mile without being asked. Donna even gave her time to help on one of the last steps that was to caulk and paint the house . I would recommend her services to any one in need. Thank You Donna Hodges for your time! - Phillip H.
Rick is a great realtor, and he helped us sell our home quickly. We sold our house in 4 weeks. He worked really hard, always answered phone calls, and was always very friendly. My husband and I just bought a home in Eugene (Santa Clara) and Rick was our agent. We were looking online from out of state and we needed someone to be our eyes and ears in the field. Rick did an awesome job of finding us the perfect home and helping us through the process! He was incredibly responsive to our every request, very knowledgeable about the local area/market (he knows everything about the local schools) and all the escrow steps and paperwork, and really guided us through the process very smoothly. He was there for our inspections and helped us get repair estimates and worked very hard from start to finish to cover every detail of the transaction while we were out of state. I highly recommend Rick's services to everyone! We initially contacted 2 other agents and either got very slow responses or no follow up at all. Rick was super on top of everything and what a night and day difference! We feel so fortunate to have found him on Zillow! And on top of all the great things I can say, we found him to be very honest and just a genuinely nice guy. What more could you ask for? What's different about my review is that we own a real estate brokerage out of state and employ 40 real estate agents. Rick is among the best of the best and if he were in our area, we'd be honored to have him on our team. He's a true professional! Thanks for everything Rick and we really appreciate all of your help! Go Ducks!! New to the area Rick showed us homes all around the region and explained the benefits of the various neighborhoods. When asked to show houses outside our comfort zone, Rick made appointments and was very adaptable with our challenging schedules. I have recommended Rick to coworkers moving to the area and will go to him in a heartbeat if we find the need to relocate again. Haley was a real asset while looking for an investment property. Easy communication and provided honest feedback. Found several properties that I'd never even saw during searches. Experience was a pleasure! Haley helped us find our home in a competitive market. She was able to drop what she was doing to show us the home we really wanted and made the buying process a more positive experience. Thanks Haley! - Anna R.
Donna is an outstanding real estate agent! She always has an upbeat attitude and seemed thrilled to show us many homes even some miles from our interested area. She was very informative about questions we didn't understand and generous when she offered to drive us to our destinations. She is extremely professional. Her people skills are great and upbeat. She always remembers personal conversations you have had and stays in contact with you years later to see how you are and remembers those past conversations. anyone! - Bobby and Holly T.
Even though an offer has been put out there for the seller to accept or not, I want to thank Cambria for sticking with us. We came out in August from California to do some house hunting for my elderly, disabled father and us to move into. She was on the ball and had listings to send to my email for me to say yes, let's look, or no, let's pass. It was wonderful to get such great customer service. She is a lovely young up and coming superstar! Cambria, thank you again and hope to see you soon!! - Denice L.
I would like to thank Cambria Core, broker with Eugene Realty Group. Cambria was very knowledgeable and did a professional, outstanding job in selling my home in Eugene. Cambria went above and beyond the call of duty in getting my home sold with having numerous open houses, consistently promoting my home on all social media sites and keeping in constant contact with me about the day to day process of selling my home. I would highly recommend Cambria and Eugene Realty to anyone and everyone interested in buying or selling a home in the Eugene area. – Martie S.
Cambria was great. She is knowledgeable, attentive, helpful and just generally a nice person. I enjoyed working with her. After finding her, the whole process became easier. We had to have four different inspections on our property before it passed. Cambria was great about getting everything arranged, communicating what needed to be done, and helping us to understand the process. - Autumn B. We used Haley Cook's services when we recently purchased our dream property. Haley was so helpful, she made the experience seem so effortlessly She is awesome! If you want a realtor that will go above and beyond then Haley is the one for you! I will use Haley's services the next time I need a realtor! - Millie K.
Couldn't be happier with service at Eugene Realty Group, Curtis and the whole team. Pet-loving people :) Thanks for getting us our first house. - Jade H.
We met Cambria at an open house where she introduced herself and asked if we had any questions. As we talked with her we realized she was not only very nice and vibrant, but also extremely knowledgeable about houses (construction issues, remodeling, neighborhoods, trends, etc…). Cambria impressed us so much, we decided to change agents! From that point on she was never anything short of amazing – and always respectful of our time. As our trust in her grew, we often asked her opinion on places we looked at and found her honesty, wisdom and experience to be invaluable. We ended up finding our dream home. I am the type of person who puts a lot of thought into “voting with my $”, and buying a new home - this is no small sum! Cambria worked very hard for us going the extra mile, and we think very highly of her as an agent and a person. We are not alone on this it seems, everyone else we worked with who know her (bank & title) absolutely love her as well. - Quint M.
Clint is a very knowledgeable realtor and was very helpful for us in buying our first home. Even though we took a long time finding one, he never lost patience and was always ready to show us more houses. I would recommend him to anyone looking to buy a house. - Stacy M.
Clint was amazing to work with...He was very professional, patient and a delight...He was quick to answer any questions that I had and I would HIGHLY recommend him to anyone that is either buying or selling a home. - Stacy B.
Clint went above and beyond our expectations. Very patient, very prompt and helped us throughout the whole process of buying our duplex. Highly recommend and will absolutely refer to all our family and friends. If your looking for a professional realtor, Clint is your Man! - Tammy G.
Donna was fantastic to work with. I could not have asked for anything more. She was very prompt and attentive to all my needs and is very proactive through the process to ensure everything right. Cambria was absolutely amazing! She understood our needs and located our ideal home quickly. We fell in love with it right away. Even though it had a 30-day close, Cambria was all over it! She worked with our lender and us on the tight schedule and made it happen in 30 days. She's kind, attentive, professional, caring, knowledgeable, punctual, and present. A 30-day close is not an easy process, but she made it pretty much flawless for us. I couldn't recommend her more! - Blake A. Thanks Curtis! You are one FABULOUS Realtor! - Sally N.
Erin was amazing to work with. She kept us informed as to the process of selling our home and was always available to answer questions when we had them. She worked really hard to ensure we closed on time and was the key to successfully selling our home!! I would recommend her to anyone looking to buy or sell!!! Clint was an incredible realtor! I was looking for a small property and did not have a large price range. Clint was a great advocate for me and would constantly be in contact about places to check out. Whenever I wanted to see a place, he would set it up the same day. As a first time home buyer, I found working with Donna to be a great experience. She was very thoughtful and supportive through out the entire process. I felt her intentions were honest and that she truly was helping me to find the best possible home for me. She was also easy to communicate with and was very fast to respond. - Sarah G.
After experiencing other realtors and having many calling to help me, i chose Clint because out of all of them, he was the ONLY one who was on it! He answered every one of my gazillion questions and he always responded to my emails, phone calls, and text messages. He is a knowledgeable hard worker who goes above and beyond. It didn't matter what time of day it was, he was there for us. Clint is a trust worthy person who is very friendly, caring, and sweet. Anytime we weren't able to do something needed while at work, Clint was always willing to pickup, drop off, and help in any way he can. Honestly, he was like a guardian angel sent by God to help us! He made the whole process of buying a house feel a lot LESS stressful. He always had our back and negotiated well on our behalf and the sellers. He was thoughtful of everyone involved. Clint and his team are wonderful to work with. I'm extremely satisfied with their services and i highly recommend them! I would also like to mention that he has great connections with lenders, home insurance, etc. that are ready to help and serve. They offer better and cheaper price than what I could find on my own. We chose to go with his connections than what we found because the prices were cheaper and the interest rate was lower. Clint even went the extra mile and gifted us wonderful gifts. They even got us house warming gifts when we got the keys to our first home! Choose Clint, he won't disappoint you. He always gets the job done! - Elizabeth P.
I had a great experience during an open house and got a chace to talk with Katie. She wasn't pushy and answered all my questions. We look forward to working with her to get in our new home. If your looking for a Eugene Real Estate Agent I highly recommend Katie. - Nathan J.
I was thinking about moving to the Eugene area, Katie took the time to take me on a tour of the Eugene area and made me realize this place is where I want to call home. From showing me whats around here to do for adventures to the beauty of all the local wineries and distance to the snow or beach, she really showed me you couldnt find a better place. - Mike D.
Clint Lewis was our broker. This man is literally worth more than gold! He doesn't wait around for the best commission to come through, and he made us feel like he put us before himself, even making sacrifices for us. If Anyon e is ever looking for a house in his area they will always get his recommendation from me. My family and I are Christians, and we truly believe Clint was sent from God to help my little family close on a house just in time! - Lucas P.
Excellent service by Rick Chesser. Would highly recommend him for anyone looking for a real estate agent! - Joyce F.
Cambria helped us purchase a house from out of state. She is extremely professional and knowledgeable. She is also caring and compassionate and easy to talk to. I would absolutely recommend her to anyone buying or selling a house in Eugene. She's absolutely awesome. - Michelle B.
Cambria is an amazing realtor and is always look out for your best interest. She had a lot of patience with us as we looked at homes weekend after weekend as we lived in Portland. She always made time for us no matter what. She always communicated with us and kept us up to date on everything, including with having her baby. Cambria was out on leave and was still looking out for us. Cambria told us about a house that we might like and arranged for us to look at it while she was on leave. This was the house we loved and Cambria helped us strategize our offer to get the home over all the other offers that come in. We didn't just find a great realtor, we believe we found an amazing friend. We would recommend Cambria to anyone buying or selling their home. Wish we would have found her sooner to sell our home in Portland. Thanks Cambria, for all that you did for us! -Glenn & Sherry M.
Amanda was enthusiastic and professional whilst helping sell my mothers home. -Brian G.
Curtis was great to work with. He listened to our wants and was able to help us find something that worked for us. He didn't put on additional pressure and was responsive to our questions and guiding us through the process at first time home buyers. -Tirsa S.
Buying a foreclosed property tends to be a roller coaster ride. We certainly had some unexpected turns, but Zoe helped us anticipate and respond effectively. As first time home buyers, we had a lot of questions. From start to finish, Zoe was consistently eager to help us understand the process. She was always willing to show us properties we were curious about. And when the opportunity presented itself for us to get this foreclosed house on Holly, she managed a lot of the difficult communications of dealing with a foreclosure. In what was a seller's market, Zoe helped us get a lot of our requests fulfilled. She was more than generous with her time ensuring that many of the repairs we needed were completed before we finally moved in. We would certainly choose Zoe again if given the chance and would highly recommend her to others seeking a house in the Eugene/Springfield area. -Daniel D.
Aleaha is an amazing person to work with. I am incredibly thankful for her. It was all of her hard work, professionalism, and exuberance that made the home buying experience so positive. Buying a home can be a scary endeavor. Throughout all of it though, we felt secure. And, we learned that we could trust Aleaha's professional expertise. I will continue to recommend her services long into the future! -Heather L.
I met Aleaha at one of the open house. I was very pleased with her service. She was always responsive, patient, and accommodating to my schedule. She kept me informed throughout the entire process. I would highly recommend her. -Charles A.
Josiah helped me sell my house and buy a new one. The whole process went easier than anticipated. My house sold in a matter of days and I got more for it than I expected. He was responsive, knowledgeable about the local market, flexible with my schedule, and patient with showing me new places. -Samantha M.
My husband and I recently purchased a foreclosure through Eugene Realty Group and would like to share our experience. The home we purchased was our first foreclosure, our realtor was Amanda Parker. Amanda was knowledgeable, professional, and extremely helpful throughout the process. We have purchased many homes in the past and Amanda's expertise exceeded our expectations. In fact, in our case, Amanda worked both sides of the aisle to get our transaction to closing. We highly recommend Amanda and Eugene Realty Group for your next real estate transaction! -Michele S.
Ashley is absolutely amazing. My husband and I consider ourselves very blessed that she is the one that answered on that Saturday when we had to suddenly switch gears in our home buying experience. The seller's agent was difficult to work with, but that didn't deter Ashley one bit and now our family is moving into an amazing house. -Melissa B.
I've worked with Bryn previously and I would highly recommend her! She is knowledgeable, engaged, patient, and honestly just a lot of fun to be around! -Jason M.
I have worked with Bryn and she is responsive, honest, resourceful, and quick. She has many contacts and is good at networking. She really understands what the customer needs. If you're working with her--you're in good hands!!! -Linda C.
I've had the privilege of working with Bryn as a professional who truly cares for those she works with. The smile is what you see first, but the heart will keep you! She will work hard for you, because she cares and listens!! -Theresa M.
Aleaha helped us find a great home. We are first time buyers and she helped us through the entire process. She was an expert at every part of the process and we could not have done it without her. We would recommend Aleaha to anyone to buy a home. -Ayla J. We worked with Aleaha and it was the best decision we could have made. We had very little knowledge about the home buying process, but she helped us through the entire process from when we first started thinking about buying a home all the way up until she met us at our new home to give us the keys. She was extremely knowledgeable about every step of the process and was a complete joy to work with! -Nate V.
Jenniffer Clark was such a blessing for the expertise she offered with selling our home and buying a new place, knowledgeable, kind, patient, and the best all around person to help us get the best price for our home and finding our new dream home. We would highly recommend her! -Joanie C.
When it came time to sell my home, I needed someone who would be proactive, anticipate the unexpected, keep me informed every step of the way, and could help me even when I did not know the right questions to ask. It was a stressful time for me anyway, and selling my home, well, let's pile on the stress, right? In all my years, I have never come across a Realtor like Jenniffer! She was always right there, supporting me and keeping me happy. She was attentive, responsive, patient, knowledgeable, skilled, fearless, and most important to me: a listener! So many Realtors have "the agenda" in their heads and you have to try and fit into their space. Jenniffer was open and flexible, yet kept the process moving in a positive direction even when things got tough. In short, she made our agenda her priority. The amazing thing was my house went under contract in about a week after it was first posted for sale, and at a price I did not even think was attainable. It was incredible! I have recommended Jenniffer to everyone I know, family and friends. One of the hardest working people I've ever met, truly professional and genuinely nice person as well! The process of selling or buying a home is incredibly difficult today, Jenniffer made it easy for me. Few realtors compare, none are better than Jenniffer! -Thom C.
Amanda went above and beyond to get my family into our first home. There were more roadblocks than we anticipated, and she helped us through all of them with patience and knowledge. She answered all of our texts and calls, day and night. I could not have asked for a better (or more patient) person to help us through our first time! -Jade C.
Bryn was an excellent partner in the home buying process. We bought our first home with Bryn's help and she made the process easy, smooth, and even enjoyable! She is always responsive to every little question or request we had and even had answers many times before we would ask a question. She got to know us quickly and was able to recommend and show us properties that fit our needs and wants. We highly recommend her as an agent! -Nate C.
Amanda delivered on every promise she made to me which included her promise to stay in contact with me and she stayed with me with great advice about the current market. I was a novice with regard to real estate and Amanda calmed my nervousness that I was selling at a price too low. She didn't tell me what to do, but instead she offered alternatives and it turned out that her advice was great! If I left a voicemail, sometimes she would return my cal immediately or within a reasonable period of time. She was there for my portion of the closing and ensured everything was done to my satisfaction. Amanda is enthusiastic and treated me with utmost respect. If I were to sell or buy another home, I'd seek out Amanda for advice and representation. She is a gem! -Richard B.
Amber was extremely helpful with every step and went above and beyond to make sure I got what I needed, sometimes going out of her way to make sure I was happy and taken care of. She is the best and I would definitely go to her again. -Katlin A. We can't say enough good things about Kendra Lewis with Eugene Realty Group! We live in Arizona, and were looking to purchase a home in Oregon. Buying a home long distance is so stressful & I know that we would not have been able to accomplish it without Kendra as our realtor. Her real estate knowledge along with her kindness and infinite patience helped us to purchase our home. Throughout the process, Kendra was positive & encouraging. When we flew to Oregon she tirelessly took us from home to home. When we had endless questions she always had an answer for us. Since we were looking long distance, we asked her to visit several homes for us to see if they might be an option. Any time we asked for anything, her answer was always "absolutely!" Once we found the right home, she went the extra mile to visit it & make sure everything went smooth when we were not able to be there. We would recommend Kendra Lewis to anyone looking for a realtor in Oregon! She's simply the best! -Cathy R.
Kendra Lewis was--and is--absolutely amazing. The process of looking for and buying a home is stressful and often discouraging. Being first time home buyers made that especially true. Having Kendra by our side made things easier. She answered every question we had, no matter how simple or complex it was. We were looking at homes in the Roseburg area, over an hour away from our apartment in Eugene, and Kendra happily drove us down, showed us dozens of houses, and stopped for lunch. We felt that she truly had our best interests at heart, never pressured or rushed us to choose. When we finally selected a home and put in an offer, Kendra worked even harder to make sure that all communication between us, the seller, and the seller's realtor went smoothly. Many times throughout the closing process we would look at each other and mention how happy we were to have Kendra working with us. Kendra was prompt, professional, and friendly. We would unquestionably recommend her for everyone. Without someone like her, we have no idea how we would have ever found our dream home. Thank you Kendra & Eugene Realty Group! -Timothy J.
Clint & Kendra were amazing with helping me and my fiance Michael find the perfect home to buy. We could not have done it without them. They are great people as well. Thank you Kendra & Clint Lewis! -Jolenerose P.
A big *Thank You to Aleaha Myers* for the great job in helping us find our forever new home in Springfield! And we are looking forward to the same great experience in helping us sell our previous home in Eugene. Aleaha is a go-getter, very patient, kind, and was very considerate of our personal needs. We would recommend her anytime. Thank You Aleaha! -Freda B.T. Bryn is such an awesome and knowledgeable agent that made the sale of our well-loved home a fun experience! We've working with another agent, but had no idea what we were missing out on until we signed up with Bryn. She was so helpful and set the right expectations from the very beginning so we were familiar with the entire process and timeline. From start to finish, she was attentive and very responsive to any questions that arose. Bryn has incredible attention to detail and growing up in the area, she is very familiar with Lane County, and what each neighborhood has to offer. She does her homework to know both parties' concerns or requests are discussed and resolved. We will absolutely use her for our next home purchase and would recommend her to anyone looking to buy or sell. -Kaity B. We loved working with Erin. She was a great help during this buying process. This was our first home purchase, and she made it an easy one. She always kept us informed on new listings that met our search. Erin is very patient and searched for about a year for our needs. She is not in it just for the sale, but she truly looks for the home that fits our needs. We love her and have made a lasting friendship. -Pamela M.
Jenniffer really worked with me on finding a house that I wanted and fitted in my needs for what I was looking for. The house that I bought at first sounded rougher in the RMLS than it actually was, at first wasn't sure if it was going to be worth m time and money on getting or looking at it. After going through the house with the owner showing what all needed to be done, with how open and candid he was along with Jenniffer's knowledge and experience I made an offer. Jenniffer made sure as my buyers agent to help explain any and all questions I had as a first time buyer, helped me through all the steps and worked with me on my time schedule. Also, Jenniffer was never pushy in anyway and started helping me right away when other agents wouldn't because I didn't have my check in hand since I was waiting for it to show up also other agent I was trying to work with were extremely pushy on trying to sell me a house that wasn't what I wanted, but more in the budget of what I had just to make their money, not Jenniffer. She 100% listened to me and wated to see her buyer happy. I never felt tat Jenniffer was trying to make a fast buck. I would recommend Jenniffer to any buyer and have even recommended Jenniffer to a family member that is planning on selling their house this summer. -Richard B.
Sara Jesus was wonderful to work with! She always greeted me with a smile and was respectful/professional. Sara was willing to show me many homes all over the Eugene/Springfield area while I tried to figure out what I was looking for. She was knowledgeable, and when she didn't know the answer, she was always willing to go find out. I felt like she was looking out for me throughout the whole process. I highly recommend Sara and if I decide to go house searching again, she will be the first person I contact! - Sarah K.
To Experience Our 5 Star Service, please contact us at any time!